In large bowl, combine all olive salad ingredients; mix well. Cover; refrigerate at least 1 hour to blend flavors. Spoon 2 tablespoons olive salad evenly onto bottom half of each bun. Top each with salami, ham, cheeses, tomatoes and about 1 1/2 tablespoons olive salad. Cover with top halves of buns. Press together gently. The muffuletta sandwich is from New Orleans, where it originated at the Central Grocery in 1906. The sandwich fillings are stacked hero-style on a round loaf of crusty Italian bread. 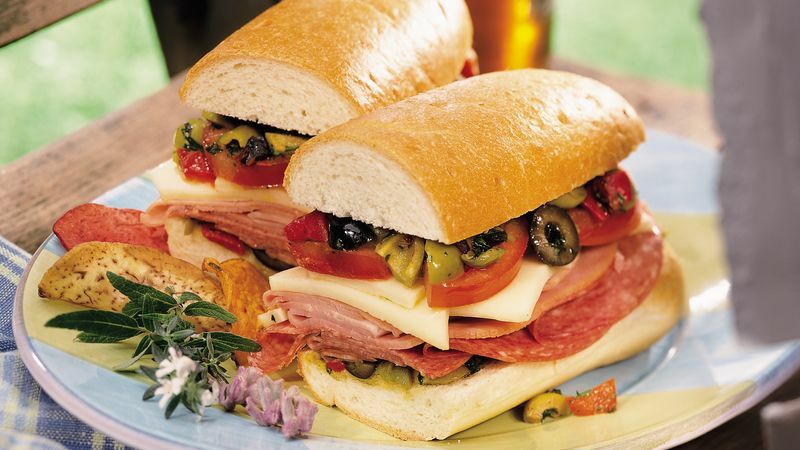 Provolone cheese, Genoa salami, and ham are topped with spicy olive salad made with green olives and pimientos. Worcestershire sauce is a spicy condiment developed by the English during the British occupation of India. The sauce is so named because it was first bottled in Worcester, England. It is made with garlic, soy sauce, tamarind, onions, molasses, lime, anchovies and vinegar. Capers are the flower buds of a bush native to Asia and the Mediterranean. The buds are sun-dried before being cured in vinegar brine. Capers are available in a range of sizes; the smallest capers, called nonpareils, are considered to be the finest.